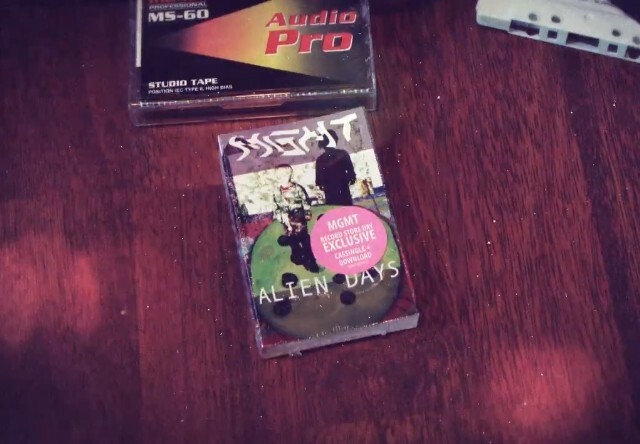 Record Store Day falls in two days, and MGMT are using the opportunity to resurrect a long-dormant format, releasing their new song “Alien Days” as a cassingle. And now they’ve made a 48-second promo video for that cassingle. It’s a psychedelic stop-motion-animated clip that stars the cassingle itself, as well as an interstellar sock puppet. Needless to say, it makes absolutely no sense, and you can watch it below. Eternal shout out to stop-motion don Ray Harryhausen, who made better-looking movie-monsters than all these CGI fucks put together. If MGMT manages to bring back stop-motion on some level, they will earn my eternal gratitude.